If you have previously purchased a Groupon and/or Living Social package (from those third parties), this is where you redeem the voucher you received from them to request your actual hotel and boat reservation package with us. When finished, click the “SUBMIT” button at the bottom of this page. Once we receive your reservation request we will contact you within 48 hours by email or phone with your booking confirmation. Submitting this form alone is not a booking confirmation. If you do not receive a confirmation within 48-hours please call us. Your purchase from Groupon/Living Social did not include the 12% Avalon City Tax/Fees and these will be charged by the hotel when we make your reservation ($48 for midweek packages or $60 for weekend packages). All major credit cards are accepted (Visa, MasterCard, Discover, American Express). 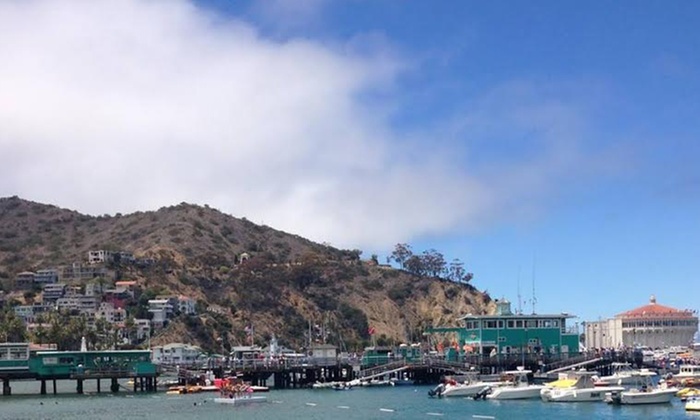 We will be making your boat travel reservations with Catalina Express and the confirmation you receive from us will include your travel information. Additional Guests (advanced booking only): Pricing includes shared room, boat and activity. Adult 12+ = $125 each; Child 3-11 = $100 each; Infant 0-2 = $25. Pets (advanced booking only): If you opt to bring your dog (advanced booking only) you must notify us at the time you book your reservation and will be charged the $25/night pet fee. Valid for arrivals from 11/5/18 thru 3/13/19 excluding: Dec, 28-31, 2018; Feb 14-17, 2019; March 17, 2019. Vouchers will be verified prior to arrival and voucher number MUST be given at time of booking as payment. Your card will be charged in full for this package. The City Tax/Fees need to be charged within the destination city. We will charge your credit card $48 for the Sun-Wed package or $60 for the Thu-Sat package. PLEASE LEAVE NOTES, COMMENTS AND SPECIFIC REQUESTS IN THE REQUESTS & COMMENTS FIELD BELOW. We provide names for the Happy Hour tour so please list both/all names in party. Thank you. We assume you are not allergic to alcohol; if you have any food allergies please describe in Requests & Comments field below since snacks are provided during the Happy Hour. Cancellation Policy: Once your booking is confirmed, there is a $25 cancellation fee as long as you cancel 7 or more days in advance of your scheduled arrival date. If you book and/or cancel within the 7 days of your scheduled arrival date there are no refunds. This also applies to no-shows. Each change made after the initial booking is subject to a $25 change fee.